Wait... WHAT JUST HAPPENED?!? This is the question most often asked when it comes to these shows. Fireworks are dangerous and not everyone should be allowed to play with them. Here are 13 characters who need to stay away from the firecrackers! What makes a woman fearless? It can be any number of factors from their job to their life status. Check out this group of fearless women dominating TV. We had the opportunity to speak with Jonathan Tucker about Jay's journey on Kingdom, as well as the finale and increasing his role on American Gods. Take a look! On American Gods Season 1 Episode 8, Mr. Wednesday recruited more for the cause, but how did it all end? Watch the full episode online now! American Gods Finale Review: Do You Believe? On the American Gods Season 1 Finale, Shadow and Wednesday attempt to recruit Easter, while Laura and Mad Sweeney pay her a visit of their own. Read on! On American Gods Season 1 Episode 7, Shadow weighed his options when it became apparent that Laura was not leaving. Watch the full episode online now! 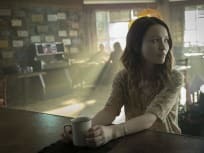 On American Gods Season 1 Episode 7, Laura and Mad Sweeney continue on towards Kentucky, while Sweeney's backstory is revealed via Essie MacGowan's life. Read on! We have one message for these shows: Don't ever leave us! We couldn't go on without you! On American Gods Season 1 Episode 6, Shadow Moon and Mr. Wednesday made it their mission to be on the right side of the war. Watch online now! On American Gods Season 1 Episode 6, Wednesday and Shadow seek out one of Wednesday's oldest friends, while Laura and Mad Sweeney go on a road trip. Read on!